WITH A “LOST PLACES” TWIST. The number one reason to visit Italy in Autumn is to avoid the crowds, but also the autumn colours that are on display and the heat in the south of the country is a little more ideal for photography workshops, with daytime temperatures that are still in the late teens and early twenties but not in the roasting mid-thirties. Due to natural disasters and urbanisation, Italy is packed with abandoned villages and towns - often in remarkably beautiful locations such as hills or mountain tops. On this tour we hunt out the gems, and take to photographing the ones that look stunning under Autumn conditions. We also visit towns that have had an upturn in fortunes in recent years but that are stunning to photograph nevertheless. I only work with experienced drivers to provide transport to each of our photography locations and this is included and provided alongside all overnight accommodation. I take care of all the bookings, so you can relax and take in our stunning surroundings as well as focus on your photography. For nearly fifty years, the town of Craco in southern Italy has stood uninhabited. 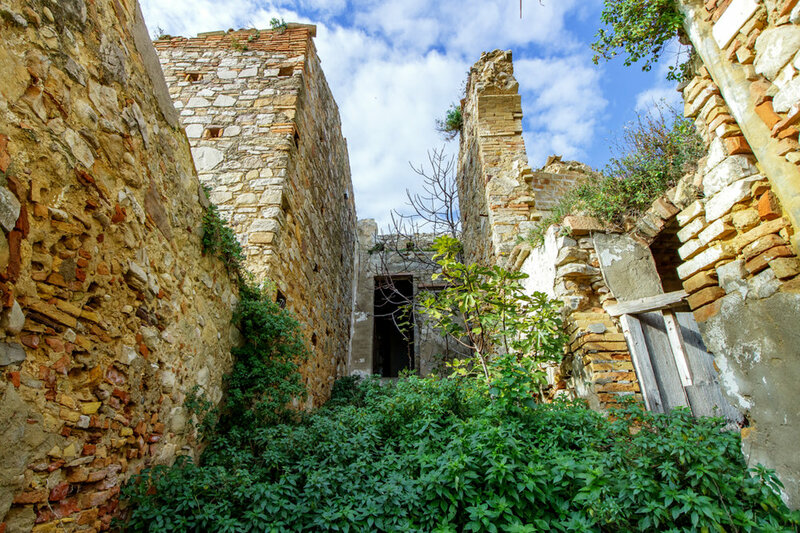 Located in the earthquake-prone Basilicata region of Italy the streets and buildings of this medieval town seem to have literally been vacated overnight, left to crumble in decay. We visit under differing lighting conditions and spend plenty of time exploring the old town by foot. From underground slum to the European Capital of Culture: Matera, the Subterranean City of Caves and one of the oldest continuously inhabited cities in the world, was once one of Italy’s most deprived cities but now an Airbnb hotspot that is set to be the capital of culture in 2019. Despite the recent growth, the city is picturesque with plenty of iconic locations to photograph (top right). My Photography adventure tours are aimed at any level of photographer who is looking to improve their photography and meet like-minded people. From beginners looking to understand the basics and improve, through to advanced photographers looking to find some great locations or rekindle their enthusiasm and inspiration. The key aim of our time together is to have fun and enjoy being outdoors whilst leaving inspired to take photos that will enter your own photography portfolio. I have organised and ran photography tours for a number of years, both personally and with friends and having left a job as an events organiser in early 2018 after 7 long years, it seems like the perfect next step that I should be running photography tours and experiences for other inspiring photographers. As we wander through the streets of Napoli, or the abandoned town of Romagnano Al Monte - I will also chat to you about the technical aspects of photography. Helping you understand your camera and settings whilst keeping it simple. I also help each day with the technical aspects, depending on your requirements. I wanted to build an itinerary* that would show the best of Southern Italy in a short time. I wanted to show you the two extremes of this beautiful country. We mix abandoned architecture photography with landscape photography in a beautiful way. Shooting locations with historic exteriors on this comprehensive adventure. *Note: The itinerary in Italy is not set in stone and can change based on environmental variables. “Single supplements” are available on request - otherwise you will be twinned/partnered with someone of similar age/interests. USA - I recommend flying into one of the large European airports and changing. In addition you could fly to Rome or Bari and transfer via public transport. Regardless of which flight you arrive on, you will be greeted by James & our driver to take you to your local apartment/hotel in Naples, where you will check in. Photography equipment, although some hire can be arranged through James in advance.